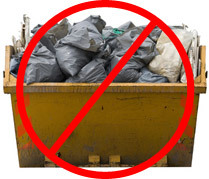 With 15 years of experience offering skip hire in Upminster you will be hard pushed to find a company offering a better level of service. Away With It are fully insured and licensed skip hire experts, and we also recycle 80% of the waste we remove from properties. If you have re-done your garden, want to clear-out the loft, or are living amongst renovation waste, then hiring a skip can be a practical solution for you. If you want no-fuss skip hire from a friendly firm with an excellent reputation, Away With It are the perfect choice. Once you have decided that skip hire is the option for you, you do not want to be waiting days for a company to deliver one. Once you are happy with the skip hire service we have tailored to your needs, we will get a skip to you at the most appropriate time for you. We understand that taking time off of work is not an option for everybody, and this is why we operate between the hours of 7am and 11.30pm. We are completely flexible for our customers and we will supply you with a guaranteed time slot of our arrival. Even better, our friendly team will give you a call when they are on your way to your property, giving you peace of mind. We are also available on Saturdays and Sundays, between the same hours. Just because it is the weekend, Away With It do not close their doors. We are available whenever you need us, and we can even offer same day collection if it suits you. Over the years that we have been servicing Upminster, our services have evolved to meet the needs of our customers. For those on a budget, we offer an alternative to traditional skip hire that cuts costs. Our two-man waste disposal teams are in your area and ready to help. If you have unwanted white goods, household waste, or garden waste, one of our duo teams can come and pick it up for you. With this option, you only pay for the total volume of waste that we remove, rather than by the load. This can work out cheaper than hiring an entire skip, especially for smaller amounts. Additionally, you won’t need to lift a finger. Our hard-working teams will do all the manual work for you. This saves time and effort for the customer. Whether you are interested in skip hire or a waste disposal team, our friendly call handlers are ready and waiting to talk you through the specifics. If needed, we can even pop to your property to talk about the waste you’d like removed. We will offer you a no obligation free quote, for both services if you desire, so that you can decide which would be best for you. Our teams are available between 7am and 11.30pm on 0208 504 7390. We look forward to hearing from you.